The collaborative robots from Universal Robots enable you to transform your ambition into profitable results. 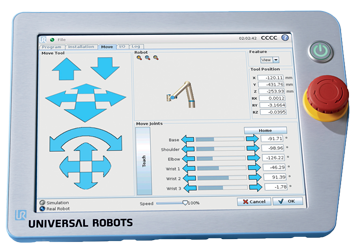 Implement it in virtually any industry, any process, by any employee - the truly universal industrial robot. Using Universal Robots allows companies of any size, but especially SME's, to grow without having to hire additional low labor. Universal Robots has revolutionized the field of automation by taking articulated robot arms out from behind costly and space consuming safety cages, away from highly trained and compensated robotic engineers, and into the common, highly flexible work-cells where they “rub elbows” with production workers. Add robot vision guidance, and your automation flexibility grows exponentially. The new Application Builder allows first-time robot users to set-up an application as the program guides them through all the decisions they need to make. Any of your skilled factory workers can become a robot programmer in just 87 minutes with the online Universal Robots Academy. Universal has created a brand new range of smart cobots that can orchestrate the entire work cell, removing areas of friction and opening up new and affordable automation possibilities for manufacturers. The robot works alongside skilled, tenured workers, with each executing on what they do best. The UR3e, UR5e, and UR10e offer the additional elements of precision, focus, and endurance to the factory floor, while humans provide greater flexibility, dexterity and problem-solving skills. People and robots working side by side allows for flexible production – maximizing resources, gaining efficiency, and creating a competitive advantage for companies of all sizes. Increase productivity, reduce ergonomic concerns and stay at the forefront of technology. With a total of six models to choose from, see the NEW e-SERIES here. Now you can have highly productive machines working in a variable and flexible manufacturing environment while cooperating with people and other machines, and delivering unparalleled work-cell productivity. Universal has created a range of smart cobots that can orchestrate the entire work cell, removing areas of friction and opening up new and affordable automation possibilities for manufacturers. The robot works alongside skilled, tenured workers, with each executing on what they do best. The UR3, UR5, and UR10 offer the additional elements of precision, focus, and endurance to the factory floor, while humans provide greater flexibility, dexterity and problem-solving skills. What can you automate today? Cobots have successfully been deployed as assistants to humans as the following videos illustrate: loading and unloading; pick and place; packaging and palletizing; machine tending for CNC; 3D additive manufacturing; metal fabricating; machine tending for plastic injection molding and die-casting; PCB handling; assembly; parts kitting; lab analysis and testing; gluing dispensing; screw driving; drilling; welding and soldering; polishing; quality test and inspection; and many more. HTE Automation is your collaborative robot, or cobot, selection and implementation resource if you are located in Kansas, Missouri, or Illinois.